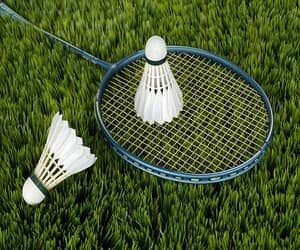 Amongst the various games played, badminton is one of the no-fuss games where anyone of all age groups can enjoy the game without the need of any professional training. People from all over the world are not only playing this game casually but also competitively. It helps people to enjoy and relax. This game can be played not only indoors but outdoors too. As a point, in fact, you can practically play badminton anywhere, even your very own backyard. The first and most main equipment in this game is the badminton racket, as badminton is a racket sport. Another equally main item is the shuttlecock. You cannot possibly play the game without either one of the mentioned items. These two items from the basic badminton set. Badminton rackets all have the same basic parts, these being the head, handle and shaft. They differ in the shape and the materials used in them, but generally, these are the main parts to look out for. When you buying badminton, there are some more terms you will need to know such as the balance, the stiffness, weight, and the grip size. Choosing the weight of your badminton racket depends on users skill of play. Lightweight rackets (85 gm) are more manoeuvrable in the court and create faster swing speed, hence preferred by mostly beginners players. Heavier rackets (88 gm) creates more energy and efficiently transfer power and speed to the shuttle. Players with strong shoulders and delicate strategy of play can handle heavy rackets for their power-packed game. 3Us and 2Us are very common in the market, whereas 4U and 5U are rare. The weights explain above do not contain the weight of the badminton string and the grip. Therefore, when you are buying a badminton racket in a shop, take into consideration that the racket will be heavier after you string it and add an alternative grip. 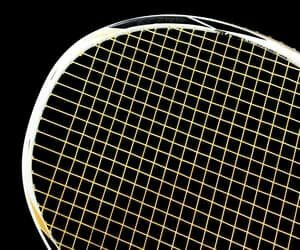 There are two main types of shape of a racket. Oval head shape- The first shape is the oval shape which happens to be the original shape. This shape causes the racket to have a lower surface of a sweet spot. This allows the user to have more powerful shots but it requires a higher amount of precision when hitting the shuttle. Isometric- The second shape is an isometric shaped racket. When given a choice, always go for the isometric shape. It has a larger sweet spot. A sweet spot is a vicinity on the badminton racket head when strike will provide highest repulsion power and an amazing racket feel. The frame, string, and tension all work together to create the feel, and playability of your racket. So when you buying badminton you should know how stringing will affect your racket performance so you can use it to help improve your game. There are many strings to select from on today’s market, and with every manufacturer carrying such a large range, try a variety of strings until you find something that suits your style best. The gauge of the string plays a big part in determining the overall efficiency and durability of the string. A thicker string or lower gauge number will be more resilient and should last longer in your frame than a thinner version. Thinner strings will not last as long but will offer a little extra zip and energy to your shots. Typical gauges range anywhere from.62mm to .85mm gauge. Finding the right balance between the playability of a thinner string and durability of thicker wider editions definitely well value the effort and always enjoyable. So next time your looking for a new string or are just trying out something new keep in mind how the thickness or gauge can have an effect on your racket. Tension is another significant aspect that will have an influence on your racquets efficiency. An easy way to find the tension range you should be considering can be found printed on your frame itself. This is known as the manufacturer’s tension range and will provide you with a maximum and minimum recommended tension for your frame. Head Heavy Balance- Head heavy balance represents to the racket in which weight of the racket is more towards the head side. The player can look into the stability of racket by balancing racket on the finger as shown in the picture. If the finger is close to head then it will be head heavy racket. Head heavy racket gives more energy on shots as it generates more strength. Head Heavy racket is compatible for that player who wants more power in shots. Head Light Balance- Head light balance refers to those racket in which weight of the racket is more towards the handle of a racket. The player can check the balance of racket by managing racket on the finger as shown in the picture. If a finger is close to handling then it will be a head light racket. Headlight racket gives racket swing speed. The Player who wants fast racket handling will like this type of balance. Grip and Grip sizes are important as player hold the racket from the grip and handle. There are three types of badminton grip available on the market. Replacement Grip- A replacement grip basically means a grip that changes the original grip. Overgrip- Overgrips are similar to replacement grips, but they are thinner and cheaper than replacement grips. Towel Grip- Towel grips are usually made by cotton they are very thick and sometimes heavy. Cotton is the best material for absorbing sweat. If you opt for a power play, towel grips might be excellent for you. The right badminton grip can exploit your performance. 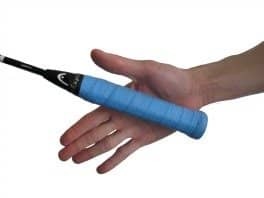 Badminton grips can also assist absorb the sweat flowing from your arm, and provide you with a comfortable feel of your racket throughout your game. Different manufacturers have their own method to tell you the grip size. Ranging from G1-G8, most badminton rackets, are either in G3, G 4 or G 5. Which grip size you use depends on how big your hands are, and your own personal preference. The handle is a final part by which player makes a contact with a racket. Handle width and grips size impact the racket performance. Shaft flexibility is just as essential as balance when purchasing a badminton racket. Different manufacturing companies used the different material to make shaft flexible. Manufacturers have usually agreed upon on categorising rackets as Flexible, Medium and Stiff. Stiffness is related to the flexibility that a racket offers. Beginners are far more likely to benefit from buying a racket with a flexible shaft. If you are uncertain about how much flex you need, then you should buy a medium or medium-stiff flex badminton racket. Medium stiffness rackets are ideal for players with a developing technique and lesser arm speed. Flexible shaft has the propensity to bend opposite to shuttle hit direction. Flexible shafts offer more power and speed for the beginners or slow arm speed players and are easy to manoeuvre. One important point is that if you are a beginner you do not need to go out and buy the most expensive badminton racket available. For beginners and recreational playing, select any cheap decent badminton racket. Yonex low-end racket- the less expensive ones are aimed at beginners because they are more flexible and will help you a little bit. The expensive models are designed towards advanced players who can most out of these rackets. Spend your money on coaching before you spend money on rackets. Commonly used materials are- the frame material – aluminium frame, tungsten carbon fibre frame, shaft materials – titanium mesh carbon graphite, steel etc. The most important aspect when deciding which racket to use is your playing style and experience. There are rackets that succeed for offence but on the other hand are not very fast in defence. Some rackets are excellent for defence but not good for the strike. Get to know your own game and style of play, then you can pick out the most suitable racket, one that will improve your skills. 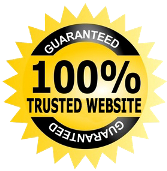 There are hundreds of manufacturers out there, all willing to help you part with your money. Just make sure you don’t run before you can walk.